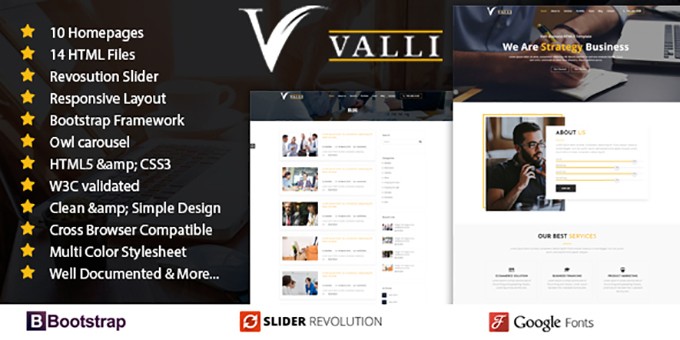 Valli is a responsive Beautifully crafted Parallax One Page Template for Business Startups, web studio and creative agencies. Responsive based on Bootstrap. This is one page for placing your information. All files and code has been well organized and nicely commented for easy to customize. It is an original business template ideal for Business Startups, web studio and creative agencies similar businesses. It has been build with the latest web technologies and standards. The layout is drag responsive and looks attractive at all screen sizes whether it is a Desktop, laptop, Tablet, or mobile. Template is bug free and has been tested on all web browsers. It has many features and can be integrated to any development platfrom/framework. It can be customized in a very easy way. Image is not included. The Construction Company Template is fully responsive layout for all type of devices. The Construction Company template is coded with beautiful and clean codes! HTML files 100% valid W3 web standards. Advance google map with all stylings support which help you create custome beautiful google map. You will get lifetime update and free support, just ask us then we will help. Multi Browsers Compability make you create website for allmost any client’s browser. You can easily create color variations switcher, so that your potential client test and check your demo web template in various color so conveniently. We’ve used the following images, icons and other resources as listed. Images used in demo, even they are sample, are not included in downloadable file. All images are replaced with placeholder. This is purely an HTML/CSS template and not a WordPress or any other CMS theme.